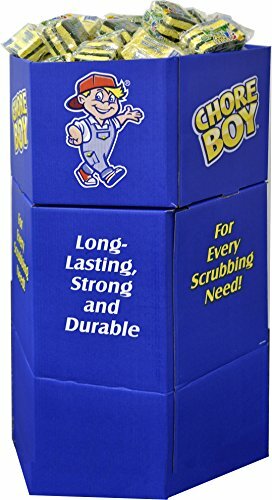 Chore Boy All Purpose & Heavy Duty 3s 72 Package Dump Bin Display Chore Boy better scrubbing pads for every scrubbing Need. Try the full range of Chore Boy scrubbing sponges and scouring products. Ideal for tough cleaning jobs. Easy to use shape. Fits comfortably in hands. Use on pots, pans, countertops, appliances, woodwork, outdoor furniture... and more! Use on pots, pans, countertops, appliances, woodwork, outdoor furniture... and more! Ideal for tough cleaning jobs. Easy to use shape. Fits comfortably in hands. Try the full range of Chore Boy scrubbing sponges and scouring products.